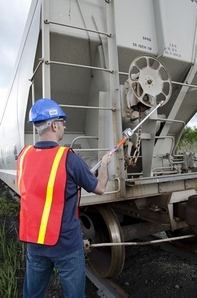 Aldon 4123-105 Brake Stick - Long, 67"-104"
No need to climb up on a ladder to apply railcar hand brake. High quality brake stick telescopes and locks from 67" to 104". User can tighten and release brakes, align car coupler knuckles, operate angle locks, and re-set end-of-train warning devices. Product Reviews for Aldon 4123-105 Brake Stick - Long, 67"-104"